Olympic Gold-medallist swimmer Liam Tancock took time out from the fast lane recently to open the new Splash Zone at Ladram Bay Holiday Park in East Devon. Set alongside the park’s main swimming pool, the 160m2 zone includes interactive water features, spray guns, and even a sea serpent that sprays water. The ocean-themed Splash Zone is part of a £1 million investment made by the family-owned park in the run-up to the 2018 summer season when its 75 anniversary is being marked. With its own private beach and longstanding appeal to young families, Ladram Bay has prided itself on continually expanding its range of attractions. 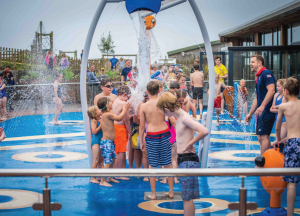 In 2017 Ladram Bay Holiday Park approached Ustigate Waterplay to request a design and build program to establish a splash zone outside their indoor pool complex. The splash pad consists of 19 products to please all ages. There is a low level interactive fi sh, six jet stream geysers and six wave geysers to tickle small children and a boat feature, tipping bucket, cannons and a sea serpent to cater for all those that love nothing more than being soaked in splash. One of the wonders of a splash pad with zero standing water is the creation of an environment where children of all ages and abilities can access aquatic recreation and play together safely. Ladram Bay director Zoe House, who is a member of the parkowning Carter family, said it was a great privilege to welcome Exeter-based Liam to Ladram Bay: “Although the Splash Zone is all about having fun, Liam knows that youngsters just enjoying themselves in the water can be a great introduction to swimming as a sport,” she said. “We have many guests which return here year after year, and we’re often told that one big reason is the wealth of things to do for all ages, no matter what the weather. “Our main aim has always been to create amazing holiday memories with fi rst-class facilities, and I think that our new Splash Zone comes right up to the mark,” added Zoe.